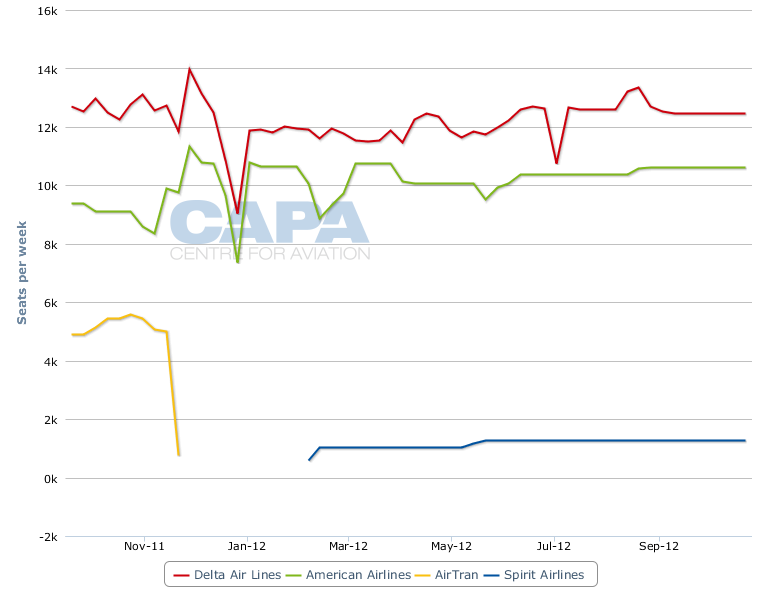 US carriers Spirit Airlines and Virgin America recorded higher than average capacity growth during 2011. But the similarities ended there as Spirit recorded healthy profits that continued into the first quarter of this year while Virgin American continued to mount losses as fuel expense and the spool-up of new markets continued to the crimp the carrier’s bottom line. While Virgin America concludes it is still in growth mode, it has only recorded one profitable quarter in its five-year history, and only four quarters of operating profits. Unlike Spirit, Virgin America largely operates to legacy strongholds, attempting to lure passengers away from network carriers with its highly-regarded in-flight experience. Although the carrier continues to rack up numerous awards for its service, the business case has yet to be proven. The carrier continued to lose money during 4Q2011 and full-year 2011. Its losses widened from USD25 million to USD31 million during 4Q and from USD69 million to USD100 million for the full-year. Full-year 2011 revenues grew at a healthy 43% clip, but a 69% hike in the carrier’s full expense and costs associated with a cumbersome IT reservation system cutover drove Virgin America’s 2011 expenses up by nearly 45%. Capacity growth at Virgin America was a significant 28.8%, as it introduced new service to Cancun and Puerto Vallarta, Mexico; Chicago, Illinois; and seasonal flights to Palm Springs, California. At the same time new service introduced to Dallas, Texas; Los Cabos, Mexico; and Orlando, Florida in 2010 was taking time to mature. Since its inception, Virgin America has been somewhat cursed in attempting to build-out a network in the mature US market during the economic slowdown. It has entered business markets like Boston, New York and Dallas that are heavily served by legacies that have the strength to match Virgin America’s pricing and offer attractive deals to frequent flyers to ensure customers do not abdicate to Virgin America. But with the exception of Toronto, Canada, which Virgin America served for a brief time in 2010, the carrier has not abandoned any routes, and appears to enjoy strong load factors in some of its older markets. US Department of Transportation (DoT) data show in 2011 origin and destination loads on Virgin America’s flights in Boston, New York and Fort Lauderdale are 80% or higher and nearly 80% for its service to Orlando. 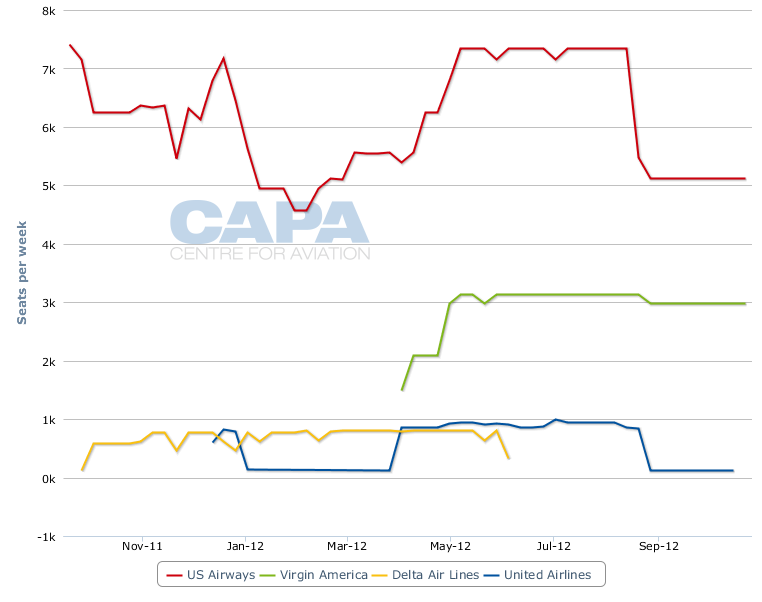 Virgin America appeared to have decent pricing traction during 2011 as its average one-way fare was USD189.05. Ultra low-cost carrier Spirit’s average price per flight segment, which was shorter than Virgin America's, was USD81 last year, but its total revenue per passenger flight segment was USD125.76. Due to its lower cost operations, Spirit grew its 4Q net income by 151% to USD24 million while full-year profits grew 5.5% to USD76 million. Spirit achieved full-year profitability while growing its capacity 15.2% as it introduced a slew of new markets, including its return to Dallas-Fort Worth, where it serves four of the top 10 domestic markets from the airport. Spirit also launched flights last year from Las Vegas, Los Angeles, Oakland/San Francisco, San Diego and Chicago. Does Spirit have a better business plan? Even as Spirit attracts a fair number of critics for bare bones amenities, brash web advertising and charges for carry-on bags, the carrier has remained consistently profitable at its high expansion rate during the last three years. 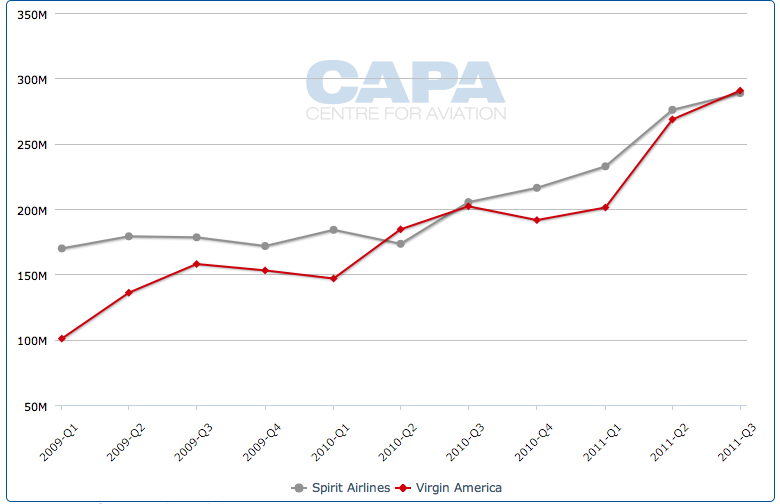 Spirit and Virgin America have essentially paralleled one another in revenue growth during that time yet Spirit has only recorded two quarterly losses while Virgin America has only seen one quarter of profitability. The carriers are somewhat close in size as Spirit is targeting a year-end fleet tally of 44 aircraft and Virgin America has an operating fleet of 51 aircraft. Spirit plans even faster expansion in 2012 as its projected capacity growth is 23%. The carrier boasts that it can grow capacity by 15%-20% during the next few years and not compress its margins. While Spirit is older than Virgin America, its transformation to a self-proclaimed "ultra" low-cost carrier began in 2007 when Virgin America was getting off the ground. Four years after making that transition Spirit delivered a 17.7% return on invested capital after taxes in 2011, which was higher than the 7.5% average for the airline industry, according to Seeking Alpha. Four years after making its debut Virgin America recorded a negative 1.7% operating margin. 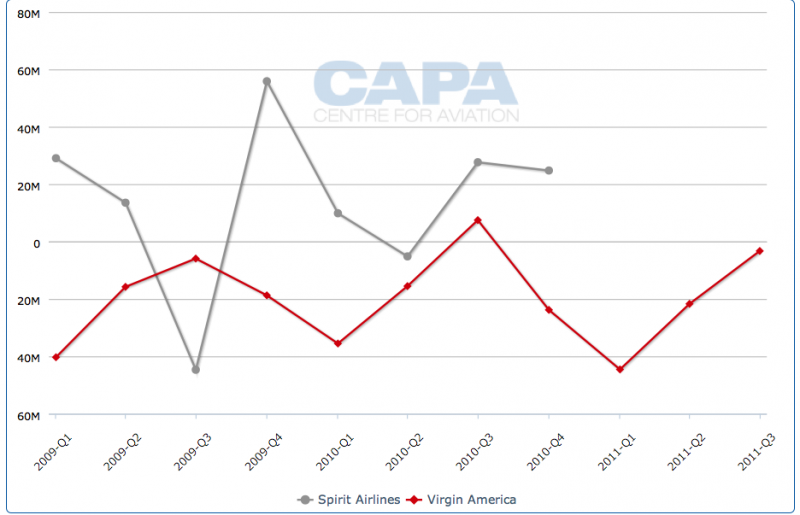 The differences in how Spirit and Virgin America operate are quite distinct. Even as Spirit makes a push into legacy fortresses, it targets low-yielding passengers that legacy airlines have largely abandoned through new-found capacity discipline, industry consolidation and fine-tuned revenue management. Spirit reasons through one to two flights per day it can stimulate enough passengers to travel on its flights without needing to capture customers from legacy carriers. For those reasons legacy carriers have largely left Spirit alone as it has made a significant domestic push during the last two years. Virgin America targets higher-yielding customers and passengers interested in an enhanced onboard experience in the legacy markets where it operates, placing it squarely in the centre network carriers’ radar of competition. US Airways’ Philadelphia hub is Virgin America’s latest market. The carrier is offering two daily flights to San Francisco and three daily flights to Los Angeles. By Sept-2012 Virgin America will account for 36.8% of one-way seats offered in the Los Angeles-Philadelphia market while US Airways’ share will be 63%. During the same time, Virgin America will only account for 22% of the seat share from Philadelphia to San Francisco, as Star partners US Airways and United will hold respective shares of 41% and 36%. While Virgin America does have strong brand awareness in its home base of San Francisco, the combined power of the Star Alliance and the connections offered through United’s San Francisco hub will be tough for independent Virgin America to combat. Spirit by contrast holds only 13% of the seats between American’s Dallas and Chicago hubs, and just a 5% share in the Delta-dominated Dallas-Atlanta market. The small amount of capacity Spirit brings to those markets is not a threat to the legacy carrier passenger base. Executives at Spirit recently remarked that in most cases network carriers ignore Spirit's entry into their hubs since it is clear Spirit is not chasing the core demographic those carriers are chasing. Spirit management does acknowledge that as it transitioned to its ultra low-cost model it was liquidity strained, and it was unclear at the time the type of traffic base Spirit was trying to attract. Five years later Spirit has emerged with a clear-cut business model that is producing impressive financial returns. During 1Q2012 Spirit grew its profits year-over-year by 197% from USD8 million to USD23 million. Five years after its launch, Virgin America, with the power of the ubiquitous Virgin brand, is still struggling to attain profits as it attempts to penetrate the demographics dominated by legacy carriers, which are strongly defending their territory.